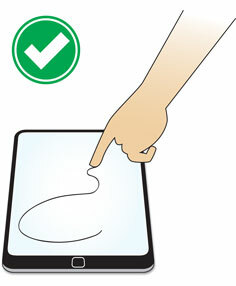 How do I know if I have a resistive touch screen or a capacitive touchscreen? Stock items usually ship the same day if the order is received before 2:00 PM Central Time. • On each webpage there is an order form that you can click on and securely place your order on-line using DocuSign. • On each webpage there is also an order form that you can download, print, and then email to info@TechGraphic.com or fax to 309-693-9700. • You can call us toll-free at 877-510-7367 ext. 261 or outside North America please call 309-693-9400 ext. 261. • We accept the following credit cards; Visa, MasterCard, and American Express. • We can send a PayPal invoice so you can pre-pay directly through PayPal. • For international orders, we accept electronic funds transfers however a USD 15.00 bank charge will apply. • We accept purchase orders from established businesses and government clients. Our payment terms are net thirty days for approved open account customers. Yes. We ship via Federal Express and add the transit charges to the invoice. If you want us to use your shipping account we can ship your order via Federal Express or UPS. Custom duties and any applicable taxes of the destination country are the responsibility of the purchaser. It depends where you are located and the quantity purchased. If you email that information to info@TechGraphic.com, we will provide a shipping charge estimate. US and Canadian shipments are shipped via UPS ground. Shipping charges will be added to your invoice. Will you sell to individuals one or two styluses for personal use? For most items our minimum quantity sold is five units. We recommend if you need only one or two styluses for personal use that you check Amazon.com. Where is TechGraphic Solutions, Inc. located? Can Specialty Stylus models be custom printed? Yes. The minimum quantity is 100 units and takes approximately fifteen business days. A layout preview will be provided to you upon receipt of your art file. We recommend that you email your art file, preferably vectorized, to info@TechGraphic.com. What if I need a custom tether length? The minimum quantity is 100 units and takes approximately fifteen business days. We will provide a quote for your specifications.